"Radharani is presented, the original pleasure potency, always absorbed in thought of Krishna. So anyone who comes before Radharani to serve Krishna, oh, She becomes so pleased, 'Oh, here is a devotee of Krishna.' She immediately recommends, 'Krishna, oh, here is a devotee. He is better than Me.' 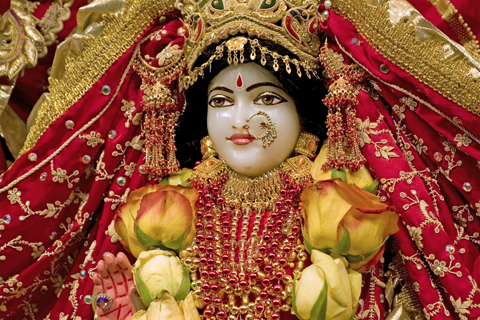 This is Radharani. I may be a, not devotee. I may be most fallen rascal. But if I try to reach Krishna through Radharani, then my business is successful. Therefore we should worship Radharani first. That is our business. Instead of offering directly one flower to Krishna, you just put it in the hands of Radharani: 'My mother Radharani, Jagan-mata, if you kindly take this flower and offer it to Krishna.' 'Oh,' Radharani says, 'Oh, you have brought a flower?' Krishna said, patram puspam phalam toyam yo me bhaktya prayaccati (Bg. 9.26), but don't try to offer Krishna directly. Just offer through Radharani. It will be very much appreciated by Radharani."